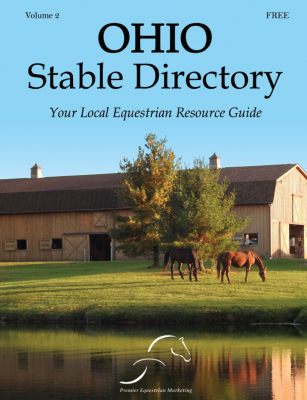 The team at Premier Equestrian Marketing is PROUD to present the Ohio Stable Directory! As equestrians ourselves, we have a great appreciation for the Ohio Horse Community. We've seen the community grow, change, and band together in times of need. We wanted to give something back to the incredible group of people that have given so much to us. How could we give Equestrians an easy way to find what they're looking for, while at the same time helping Equestrian businesses find new customers and grow? An answer to this question, the Ohio Stable Directory was born. This all-inclusive guide is a great resource for all things Equestrian. Need a horse show braider? Looking for a new barn? Simply flip through the directory to find what you're looking for. To see the 2017/2018 Directory, Please Click the Image below!